Mark Graver (Lamas) is a mild-mannered CIA agent but also a man of action. He won’t hesitate to jump into the fray and cut through the red tape. Further evidence that he is cool are his ponytail and constant, well-groomed five o’clock shadow. (Graver’s Chief: “I don’t approve of your methods, but you certainly get the job done”.) Graver gets the assignment of a lifetime when he goes up against a gang of terrorists led by the sadistic Victor Mahler (Cord). These baddies shoot up churches, kill cops and are just plain evil in every regard. And now they want nuclear weapons. To get them, Mahler must get a hold of “The Microchip!” and he will go to any ends to get it. Meanwhile, cops Murphy (Simpson) and Benedetti (Griggs) are also working the case, and they come across Alexa (Kinmont), a ruthless assassin working for Mahler. Soon, Graver realizes he can use Alexa to infiltrate Mahler’s compound but he must undo her brainwashing. So he basically kidnaps her young daughter and keeps them both at a massive CIA compound. So now the feds, the cops and Alexa must work together to bring down Mahler because Alexa’s daughter, and the fate of the world, are at stake. Will she come through, or revert back to her old ways? A major plus for this PM production is its fast pace. The movie really zooms by, and no wonder, as it has classic Lamas, Kinmont as a very tough cookie (Lamas and Kinmont together once again), Alex Cord, in a very entertaining manner, chews the scenery, a rockin’ score by Louis Febre, a CIA command center that has it all from martial arts training to a gun range to an upscale restaurant - all in one room, and, last but...actually least - OJ Simpson. What other movie could claim these things? OJ puts in a mush-mouthed and flat performance, and was seemingly bored. Maybe he had other things on his mind? He does mention how he’d love to “beat the information out of her”, referring to Alexa. I’m sure it’s just a coincidence. Away from The Juice, this movie actually has some surprise punchfighting. Mahler is so evil, he stages deathfights at his mansion for his, and his guests’ amusement. One of the fighters’ trunks say the word “kickboxing” on them. Guess who wins the match? The movie has the fun cliches we all love and enjoy, and a climax at an airport you could never do today. That’s why people keep coming back to movies like this. They represent a different time, and it wasn’t even all that long ago. The world is much more politically correct now, which is a shame. So keep watching 80’s and 90’s action movies. If you’re a fan of the PM style, you will like CIA Code Name: Alexa. I watched this movie and its sequel several times in the mid-'90s, only because I had a crush on Kathleen Kinmont. That is pretty cool. Kinmont is definitely beautiful. So true! There is never enough time to watch all the bad action flicks we enjoy! Definitely interested in your opinion on these. Also: CIA 2 will be posted this Saturday. I have never heard of this but feel like I must see it now. When I was a youngun, I was convinced that I would grow up to be as badass as The Renegade. Didn't quite happen. KATHLEEN KINMONT!!! I love that woman. I need to see this movie. And its sequel. I was just watching 'One Mans Justice' with Bosworth and it has to be reviewed urgently. I'd like to think I'm somewhat of an expert on films of this nature and there's hundreds out there, but this demands a review! Dr. Algernon: That is awesome you that wanted to be like Lamas. Will have to watch Mega Shark Vs. Giant Octopus soon! Mr. Gable: Same Here, Love Kinmont also. Would be interested in your take on them! 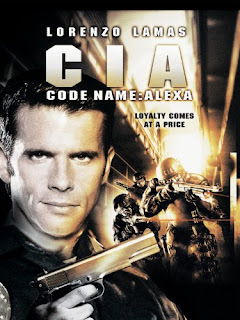 force_field: Looking forward to your opinion of both CIA movies, force_field. Thanks for your comment. I just watched this as part of my Lamas Legends column. It wasn't bad, but I was hoping for more. Then again, I watched it immediately after viewing Body Rock, so that was a tough act to follow. Haha, totally agree, Body Rock is tough to follow. CIA 1 was pretty decent. CIA 2 isn't as fun as the 1st. I had this as a silly, bad movie, made funnier by the OJ factor, and the fact that we were supposed to accept Lamas as a CIA agent. Good stuff. O.J. was great in this! He could have been a hilariously bad action star. You know what's even more hilarious? O.J. actually auditioned for the roel of the Temrinator, but he was rejected by producers, because they didn't think he would be "convincing" as a killer, i'll bet they're eating those words now!